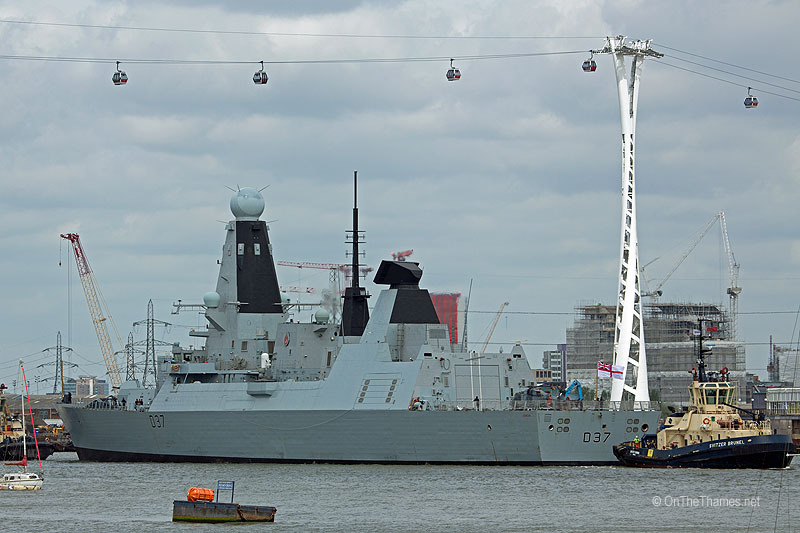 A ROYAL Navy Type-45 destroyer sailed up the Thames to West India Docks today. 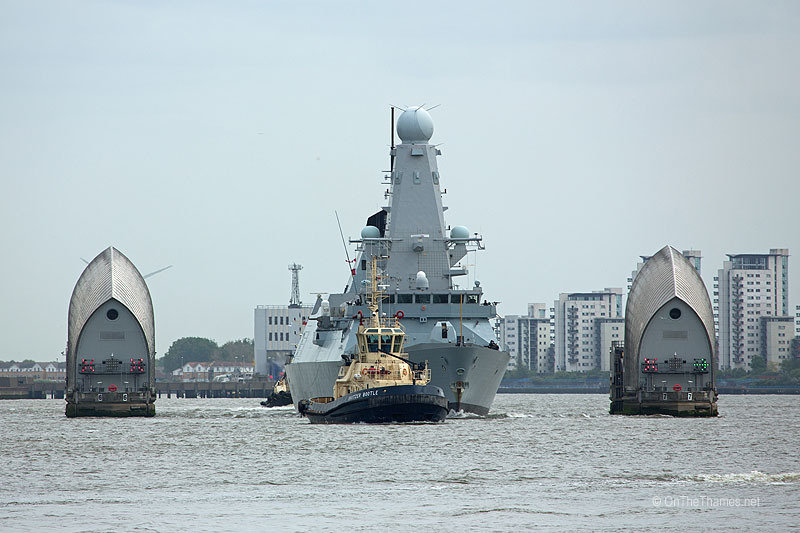 The port visit to the capital is the first by HMS Duncan - the sixth and final of the Daring-class ships which were built by BAE Systems Maritime. 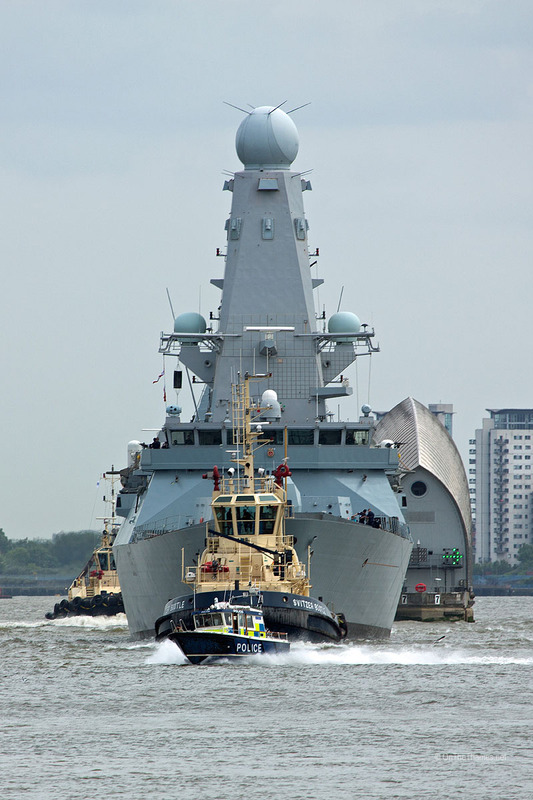 By the time she reached the Thames Barrier, the 8,000 tonne ship was accompanied by a trio of Svitzer tugs - Brunel, Bootle and Harty - and several police vessels were present, too. 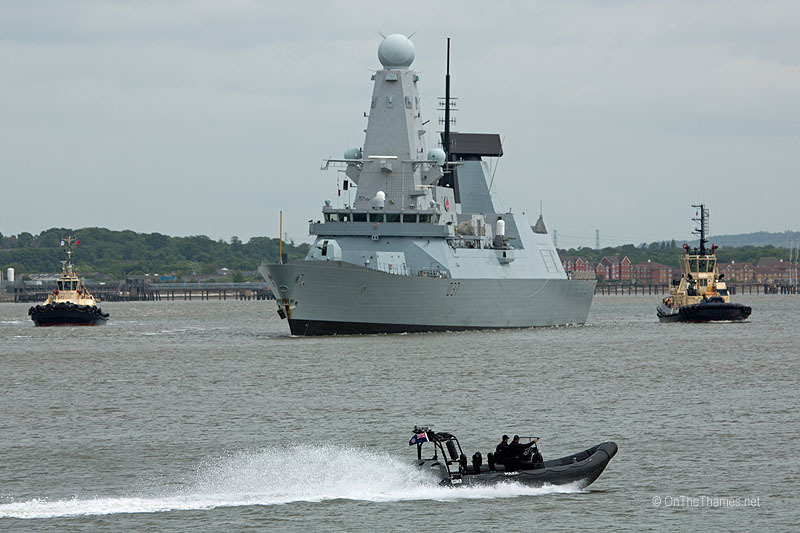 Members of the public will have the chance to look around the Type-45 during the port visit - tickets for tours remain available at the time of writing. 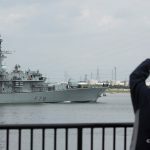 It's the first of three visits by HMS Duncan in both the United Kingdom and Germany to mark the centenary of the Battle of Jutland. 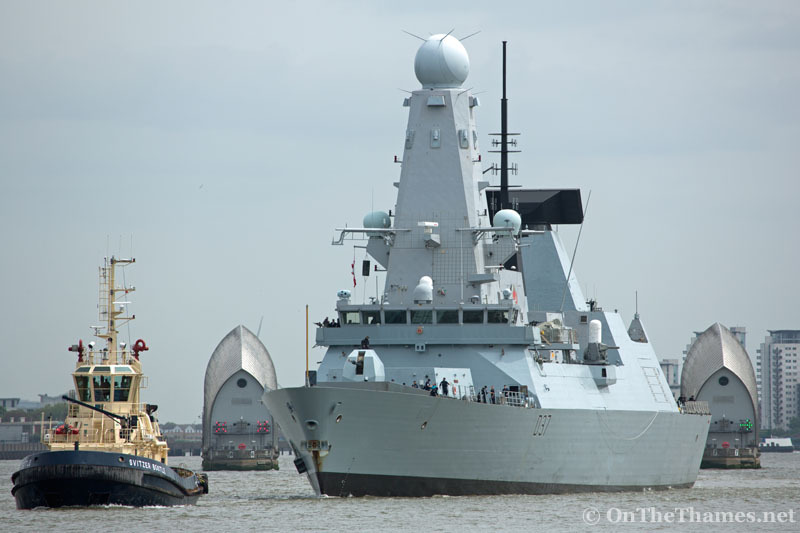 Commander Charles Guy RN commented: “I’m honoured to be here in London to commemorate the immense sacrifices made at the Battle of Jutland 100 years ago this month. 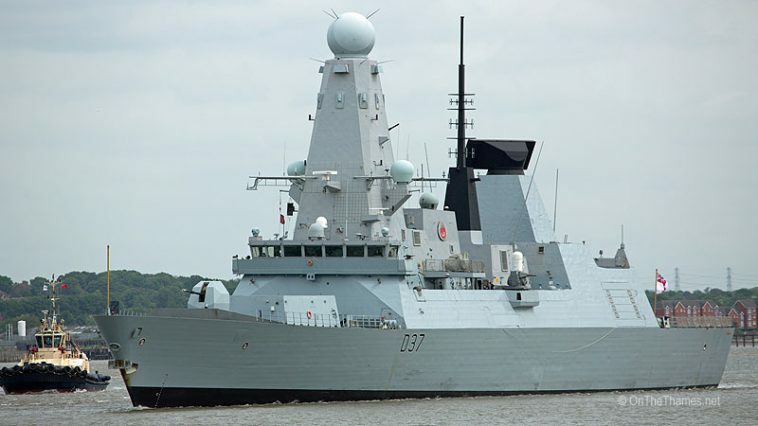 HMS Duncan is the Royal Navy's newest warship, having been commissioned in 2013 and then going on her maiden deployment to the Middle East for nine months in 2015. 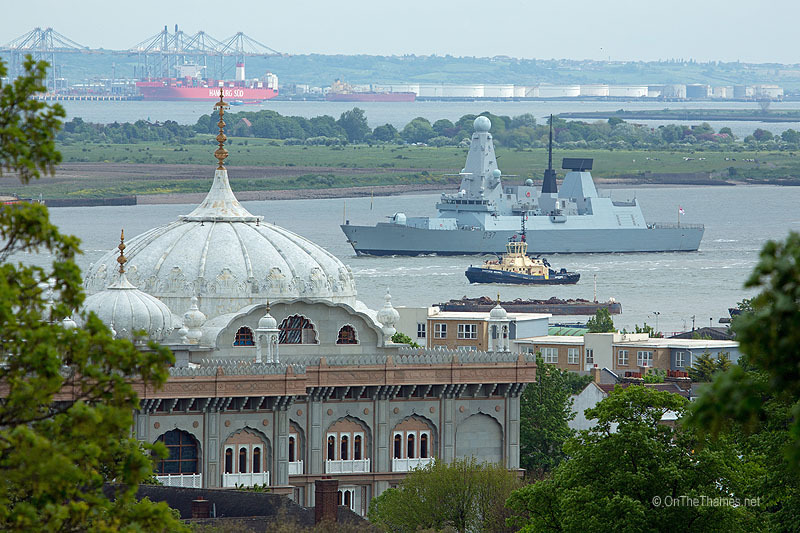 HMS Duncan makes her way up the river, passing the Sikh temple at Gravesend. 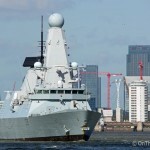 One of the Cap San container ships an be seen alonside at London Gateway in the distance. 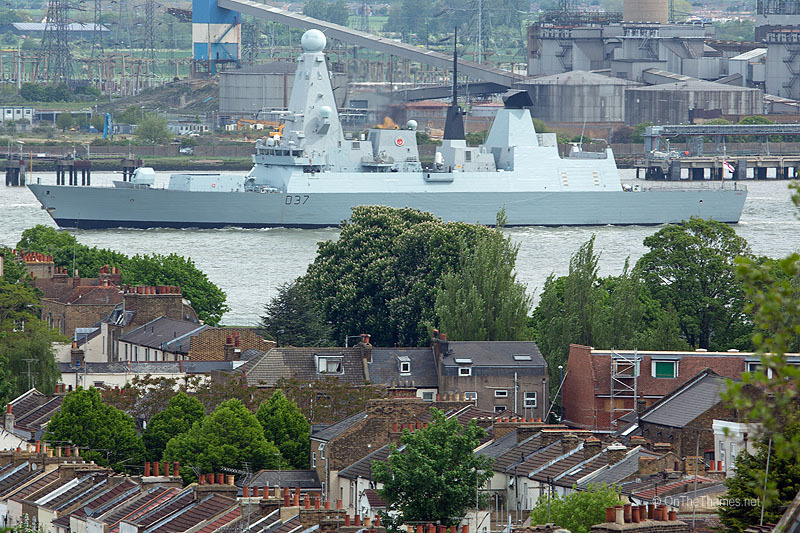 The Daring-Class ship passes Gravesend roof tops on her way up the Thames. 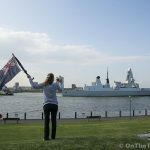 The ships motto translates as "Upright in prosperity and peril"
Sorry Stuart – she actually left about the same time you posted this. 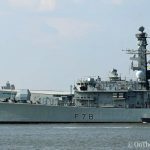 If you don’t already, feel free to follow on facebook.com/thamespics where I try to put that kind of info up or answer questions etc. 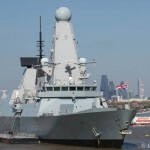 Super to see HMS Duncan, the best Destroyer in the Fleet, on your website. Thanks Rob for posting your photos. Looking forward to seeing more. Turn up for the books. 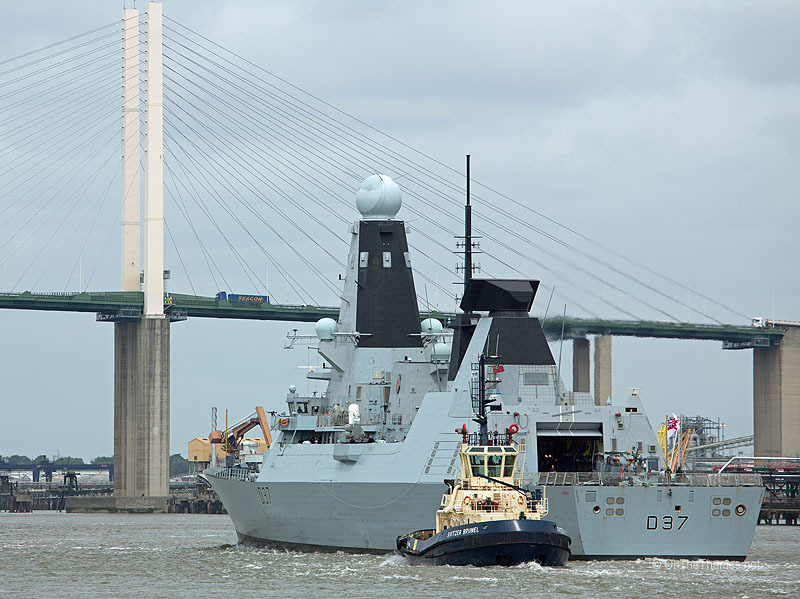 I served on the last HMS Duncan, a Blackwood Class frigate, on Fisheries Protection Duties in 1961-62. World of difference to the tin-can then and this piece of technological magic. 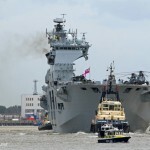 Hope to see her tomorrow.